Russia has banned parts of Reddit. It wasn't because of the jokes featuring Russian President Vladimir Putin, or the discussions about the crisis in Ukraine. It was because of a two-year-old thread discussing how to grow hallucinogenic mushrooms. Russia's federal information watchdog Roskomnadzor threatened to take the entire Reddit site down unless its administrators remove pages that refer to growing "magic mushrooms" and cannabis. Roskomnadzor said it was acting on a request from the Russian Federal Drug Control Service, which said the page was promoting the use of illegal drugs. The Internet watchdog threatened to place Reddit on its list of illegal websites, and posted announcements on its official social media accounts asking service providers to restrict access to the page. The Russian information watchdog announced the ban on its Twitter account. It later reversed the ban, saying Reddit has complied with its requests and restricted Russian access to the offending page, titled "Minimum and reliable method of growing psilocybe." 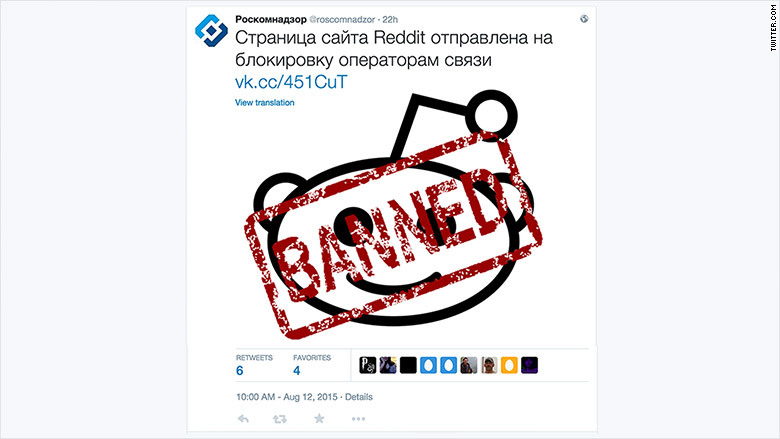 Reddit is not the only Western site to find itself under scrutiny in Russia. Sections of Wikipedia have been previously restricted because of content related to suicide and drugs, and blogs of Kremlin critics Garry Kasparov and Alexei Navalny have been banned. Russian government also asked Twitter to remove 121 posts last year, while Facebook restricted 84 pieces of content based on government requests. The watchdog can order Internet service providers to block content without a court ruling, and can fine them if they refuse to comply.